ປະທານາທິບໍດີສະຫະລັດ ທ່ານດໍໂນລ ທຣຳ ກ່າວຄຳປາໄສຕໍ່ປະເທດຊາດ ທີ່ມີການປະກອບສ່ວນຂອງທັງສອງສະພາ, ທີ່ສະພາຕ່ຳ, 5 ກຸມພາ 2019. ປະ​ທາ​ນາ​ທິ​ບໍ​ດີ​ສະ​ຫະ​ລັດ ​ໄດ້ຂຶ້ນກ່າວ​ຄຳ​ປາ​ໄສ​ຕໍ່​ປະ​ເທດ​ຊາດແບບແຕກ​ຕ່າງ​ໄປ​ຈາກ​ປະ​ເພ​ນີ​ທີ່​ເຄີຍ​ປະ​ຕິ​ບັດ​ມາ ແລະ​ໄດ້ເລີ່ມ​ຄຳ​ປາ​ໄສ​ຂອງ​ທ່ານ ໂດຍບໍ່​ໄດ້​ລໍ​ຖ້າໃຫ້​ມີການ​ນຳ​ສະ​ເໜີ​ໂດຍປະ​ທານ​ສະ​ພາ​ຕ່ຳ, ທ່ານ​ນາງແນນ​ຊີ ເພ​ໂລ​ຊີ ຈາກ​ພັກ​ເດ​ໂ​ມ​ແຄ​ຣັດ, ຜູ້ທີ່​ທ່ານ​ໄດ້​ປະ​ທະ​ກັບ ໃນ​ບໍ່​ເທົ່າ​ໃດ​ສັບ​ປະ​ດາ​ຜ່ານ​ມາ​ນີ້ ເສຍ​ກ່ອນ. ຂອງ​ທ່ານເພື່ອ​ເອົາ​ງົບ​ປະ​ມານ 5 ພັນ 7 ຮ້ອຍ​ລ້ານ​ໂດ​ລາໄປ​ສ້າງ​ກຳ​ແພງ. ປະທານາທິບໍດີສະຫະລັດ ທ່ານດໍໂນລ ທຣຳ ຈັບມືກັບປະທານສະພາຕ່ຳ ທ່ານນາງແນນຊີ ເພໂລຊີ. ຮອງປະທານາທິບໍດີສະຫະລັດ ທ່ານໄມຄ໌ ເພັນສ໌ (ກາງ) ທີ່ເຂົ້າຮ່ວມ, ທີ່ສະພາຕ່ຳ, 5 ກຸມພາ 2019. 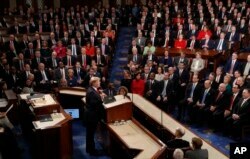 In his second State of the Union address Tuesday night, U.S. PresidentDonald Trump laid out an agenda that included calls of bipartisan cooperation and unity. But he also slammed what he called "ridiculous partisan investigations" and stood firm on his demand for a wall along the country's southern border. White House correspondent Patsy Widakuswara reports. "Madam Speaker, the president of the United States." 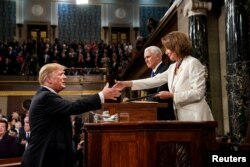 President Trump broke with tradition andbegan his State of the Unionspeech without waiting to be introduced by the Democratic speaker of the House Nancy Pelosi, with whom he clashed with in recent weeks. "We must reject the politics of revenge, resistance, and retribution." As is the norm, Trump gave a long list of achievements. "There's nothing anywhere in the world that can compete with America." But immigration soon came to the forefront, an issue Trump is fighting with Democrats, who continue to deny his demand for $5.7 billion border-wall funding. "In the past, most of the people in this room voted for a wall -- but the proper wall never got built. I will get it built." The wall feud partially closed the government for 35 days. If no deal is reached by February 15, another government shutdown looms. "He didn't give the Democrats anything that they wanted to hear. He didn't make any offers, he didn't propose any compromises. I don't think he moved anyone any closer towards a solution." Female lawmakers of the Democratic party wore white to mark the suffragette movement that lead to women's right to vote. Most of them did not clap during the speech, except when Trump extended an olive branch ((offered to end disagreement)), and noted that a century after suffragette, a record number of women are serving in Congress. On Foreign policy, Trump expressed support for regime change in Venezuela, and touted what he considered his successes, including the trade war with China, the U.S. withdrawal from a nuclear treaty with Russia, the reduction of tensions with North Korea, and the continuing pressure on Iran. Trump outlined elements of a bipartisan agenda such as boosting infrastructure, givingpaid family leave, lowering the cost of healthcare, eradicating HIV, the virus that causes AIDS, and childhood cancer. But he also pushed for issues important to his political base, including legislation prohibiting late-term abortions, and slammed the investigation into possible collusion between his presidential campaign and Russia during the 2016 election. Stacey Abrams, who narrowly lost a bid in November to be Georgia's governor, delivered the Democratic response, highlighting access to voting rights. "We must reject the cynicism that says allowing every eligible vote to be cast and counted is a power grab." From marriage equality,healthcare, toconfronting racism,Abrams laid out her party's agenda. "I think it sent a message that this is the Democratic Party of today, a woman, a woman of color, a woman who comes not from the politician class." For one of the president's guest, Pittsburgh synagogue massacre survivor Judah Samet on his 81st birthday.